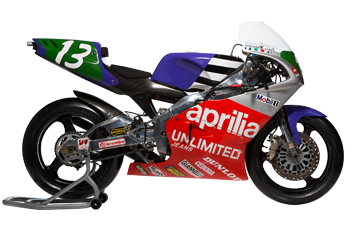 In 1991, the Grand Prix Aprilia changed its name to the initials RS/V: the motorbike was heavily modified compared to that of the previous season in terms of carburetors, the cooling system, thermal unit and ignition. The teams are also revolutionary: the internal team boasts Loris Reggiani, and there is a motorbike for Team Valesi that is enrolled in the Pierfrancesco Chili World Championships. The Italian 250 is now one of the best of the group. 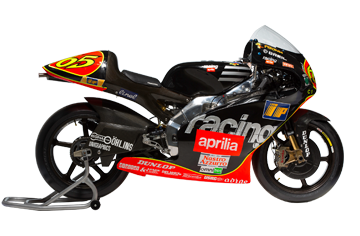 The 1998 season is a triumph for Aprilia who, in the 250 class, wins 13 of the 14 GP races, leaving only the opening race in Japan to the competition. Loris Capirossi wins the Rider championship. The superiority of the Aprilia 250 has been such that its riders have taken all three steps on the podium four times. 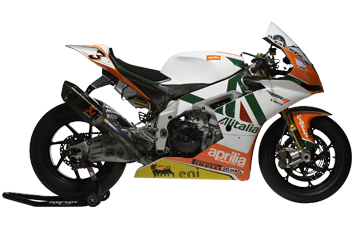 Aprilia also wins the 250 World Manufacturer Championship with a large gap. The triumphant year of the Aprilia in the 125 World Championship has a name: Valentino Rossi. With 321 points earned, eleven victories (Malaysia, Spain, Italy, France, the Netherlands, San Marino, Germany, Brazil, Great Britain, Catalunya and Indonesia), Valentino annihilates the competition and was awarded the drivers title, contributing to Aprilia winning the Constructors Title. This victory also made Rossi a household name, thanks to his extroverted character and great communication skills. 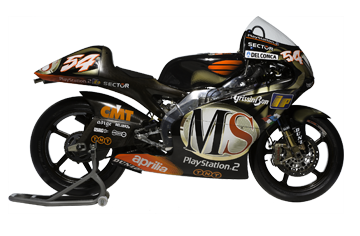 After 52 years, the 500 class said goodbye and became the MotoGP for 4-stroke engines and cylinder capacity up to 990 cc. Every manufacturer took its own path, and Aprilia, for the only class for which it has never won a title to date, chose that of technology with the RS Cube: 3 cylinders (on paper the perfect fractionation, extensive use of prized materials, carbon clutch, pneumatic valves and electronically controlled accelerator. Entrusted to the French driver Régis Laconi, it debuted slightly too early for that required of such a futuristic project. Noriyuki Haga was constantly in the higher areas of the classification at the 2002 Superbike, but due to unexpected tyre failures he was not able to use the Ducati as the superpower that it is as Troy Corse had done with the semi-debut of RSV in 2000. But even the Superbike is no longer the same: the four-stroke MotoGP competition put the formula in question and big changes were on the horizon. At the end of the season, Aprilia, like many other Manufacturers, decided to suspend its participation in the SBK before the events, transferring Haga to MotoGP. 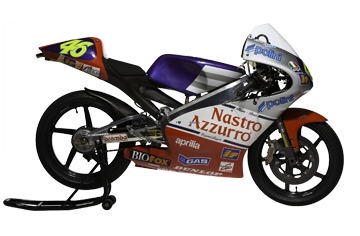 In 2003 came a long-awaited but well deserved title in the 250, won by San Marino native Manuel Poggiali in his first year in the category. It was an event that was not repeated since the golden age of the "American school", with John Kocinski. 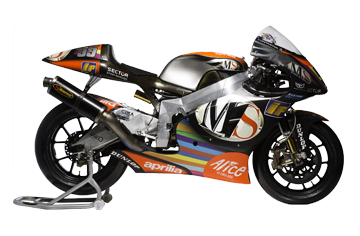 The ambitious Aprilia RSV4 project started in the SBK 2009 season. 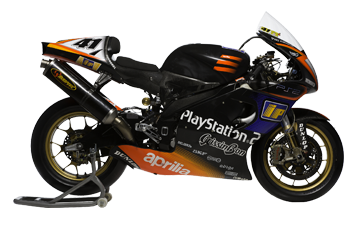 Alongside the commercial launch of the RSV4 was a revolutionary supersport bike featuring a highly evolved 1000 cc, 60° V4 engine, with which Aprilia Racing planned to return to the Superbike championships. Aprilia entrusted the project to driver Max Biaggi, who returns to Noale twelve years after his last title in 250; he was joined by Shinja Nakano, from Japan. The year of the debut marked a continuous growth of the bike, and the first success on the BRNO track. Another eight podiums were added to that victory, in witness of the value of the project as well as the driver. But it was in 2010 that the masterpiece was completed: the RSV4 and Max Biaggi, who started the season with the intent to continue the growth trend in the first championship, find themselves battling for the top position. After a series of exciting successes, Max Biaggi became the SBK World Champion, and the first Italian to win this title. Aprilia is Constructors’ World Champion. This triumph marks the beginning of a long series of victories: Biaggi won the championship in 2012, and the RSV4 earned the Constructors’ Championship in 2012 and 2013. In 2014, a new championship arrived with Sylvain Guintoli and the third consecutive Constructors’ Championship, demonstrating an indisputable technical superiority. For the Aprilia RSV4, it is the third double win in the world championship after those of 2010 and 2012. Seven World Championships, 44 victories, another 102 in the top three and 11 awards were earned at the SBK World Championships for one single bike, created to dominate on the track as well as on the road.